She could feel Queen Elizabeth II's affection for China while presenting her credentials to the monarch a couple of months ago. It was evident in the queen's tone. "Her Majesty was very impressed on her tour of China in 1986. She recalled discovering that the expressions of each of the Terracotta Warriors was different," says Fu Ying, China's ambassador to the United Kingdom. 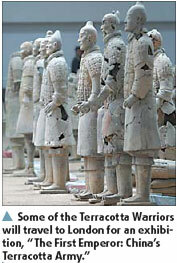 The warriors in Xi'an were made to guard of the tomb of the first Chinese Emperor Qinshihuang. 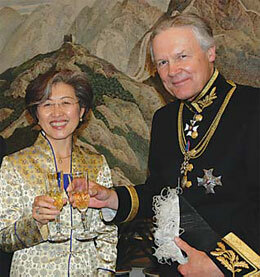 Fu Ying with Sir Anthony Figgis, HM Marshal of the Diplomatic Corps, at a reception after she presented her diplomatic credentials to Queen Elizabeth II at Buckingham Palace on June 12. Fu presented something else with her credentials to the queen: copies of British Illustrations from the Imperial Archives. "The illustrations on 18th century Britain was that country's gift to China in 1793 and Her Majesty liked it," Fu says. But her focus will be on Chinese enterprises' investment in the UK. Fu says the UK attracts about $170 billion from leading financial and service industries across the world every year because of its favorable investment environment. Many Japanese and South Korean companies have expanded across the globe from the UK because it provided them with a perfect international platform.